Workflow and sound are amazing. For this money we'd go for the X32 over a full analogue mixer/outboard combo. Great sound quality reverb algorithms emulating big name favourites. Fast, intuitive work surface. Loads of in/out connections. No USB keyboard channel-naming. One-way DAW automation. Needs a tape saturation effect. The first product born of Behringer's buyout of the Midas/ Klark Teknik group is a powerful digital mixing console. But can it really challenge an audio professional's preconceptions of the brand? Prejudice is a powerful thing. It's something that this reviewer must admit to having in the past towards Behringer - and we don't think we're alone. Meanwhile, we've also been predisposed to like Midas products. This audiophile snobbery can be traced to the roots of each company. "When the Midas/ Klark Teknik group was purchased by Behringer, many audio professionals took notice"
Behringer has been manufacturing audio equipment for 20 years, having started as a 'kitchen company' when Uli Behringer realised that he could make affordable alternatives to established, expensive effects and signal processors. Meanwhile, for 42 years Midas has been the no-compromise 'Rolls-Royce' option. The average pro-touring band's tech rider usually specs a Midas as their preferred choice of mixing console, and actually often states 'NO BEHRINGER!' in ugly bold letters. The X32 comes in a huge cardboard box, but, once out of its substantial packaging it's actually nicely sized. 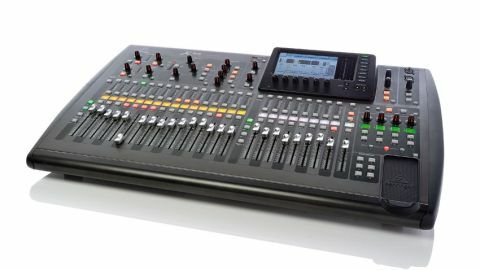 It weighs a reasonable 20kg, making it smaller and lighter than most analogue 32 channel mixers. It even comes with a fabric cover, which is great for keeping the surface clean and free from debris. "For us the biggest plus is the colour-changing scribble scripts"
It takes a respectable 16 seconds to boot up, or only 11 seconds with a good USB key connected, and powered up it looks and feels very solid and quite expensive. For us the biggest plus is the colour-changing scribble scripts, although some of the colours made the text hard to read. We ended up labelling channels by colour alone, it's quicker to identify. Labelling directly isn't fast, although there are presets with images available. We were a little annoyed that there is no way of using a USB keyboard (yet) to name channels, though the PC and iPad remote software does allow this. While the faders may feel a little cheap, they still come out on top, when compared to other manufacturers' budget offerings. "The X32 has a stack of input and output connections - we found the only things missing are some digital ins and a word clock"
The X32 has a stack of input and output connections - we found the only things missing are some digital ins and a word clock. These ports can be expanded with the AES-50 multi-core in/out and Ultranet personal mixers, and Behringer are looking into option cards such as Dante and MADI. The layout is brilliantly thought out and the workflow is very intuitive. However, we were disappointed that the automation control only works from the X32 to your DAW, fitting the Mackie HUI protocol. As the X32 has now replaced the audio engine of my DAW, I wanted to automate from the DAW to the X32, but can't yet. Jumping between mix snapshots is quick and smooth, and could be used for dropping into crazy effect scenes just for certain sections of a song and back out again. MIDI scene recall is available. The Scene saving/recall feature is brilliant, far better than much more expensive competitors. Most digi desks only allow global USB stick recall of desk setup, so if your output configuration changes between different shows, then it can become tricky. Not so with the X32 - just choose what is safe from recall, and off you go. We love that it has several ways of doing things - without too much of a sweat we can do two things, or have two engineers using it at once. For example, aux bus sends can be accessed on a channel by channel basis (using the rotary encoders in the channel strip) or by using eight sends at a time on the centre bank of faders (by selecting a channel and pressing 'sends on fader'). If you select a master output fader before or after pressing this, the 16 input faders then give you the send level to that output over each of the input channels. "Most of the features are very fast to get to and three pages of assignable buttons and encoders make it even faster"
Most of the features are very fast to get to and three pages of assignable buttons and encoders make it even faster. We didn't like the sensitivity of the assignable encoders - they're great for fine control, but it took too many complete rotations to get where we wanted. Making these knobs velocity sensitive would be an improvement. However, we thought it was great how you could set the buttons to jump anything. We used our last page to jump to graphic EQs, if you leave the 'GEQ on faders' selected, then one button press gets you to the relevant graphic, and maps the graphic EQ to the eight master faders. Dealing with the dreaded feedback is speedy on this bad boy! We got used to looking at the controls and thinking, "Oh, you can't do such and such," only to find there is another way. For instance, there is no automation but, as it's digital, you can bounce audio through it with no conversion loss, and record the output to run live FX automation etc on the fly. There are very few things it doesn't do. We didn't miss much - with lateral thinking a work around could be found for different applications and uses. We loved using the group mutes mixing dub style with effects. We could split an input across two channels, have one assigned to the group mute, and have the effects sent off that. Being able to add reverb blooms to snare, or delays to a vocal, no matter what page our faders were on at the time is pretty handy! Any routing is very simple, and is done in blocks of eight, but you can change each channel's input one by one, or the sidechain input for the dynamics quickly and easily. "As the effect and routing options are so good and extensive, the computer becomes secondary to a session"
As the effect and routing options are so good and extensive, the computer becomes secondary to a session, and we found ourselves able to work with only minimal mouse wiggling. We did a series of projects with the reggae band, One Shot. We recorded their whole set in the studio, mixed it down, stored the mix and then recalled it at a live gig. This preset mix/mic configuration meant the sound-check took just seven minutes - it took longer to plug in all our mics! Using the X32 for getting up a good sound is quick, simple and fun. For recording, we gave each of the musicians their own headphone mix, and once they were happy, we turned to the PC and started up the multi-track. It was immediately apparent that the guys had never had monitoring as good as these headphone mixes. We all loved the sound of the effects in the X32, especially the reverbs. There are lots of effects available, the only thing we missed was a decent tape saturation/delay. While there are a few things about the X32 that might not be perfect, there are many things about it that are. We tried quite hard to break or confuse it. At one point we succeeded and upset our DCA master solo and a couple of other things. Behringer, with typical German efficiency, sent us firmware update 1.09, which arrived two days later and fixed the problem. "The X32 feels like a stealth-Midas. At some point it had to stop being a Midas, and become a Behringer"
They also confirmed they are considering adding 96kHz functionality on version 2.0, sometime next year, but have a number of features to add before this. I found its service was much better than some forum posts would have you believe. The X32 feels like a stealth-Midas. At some point it had to stop being a Midas, and become a Behringer. We just hope that the build quality will prove itself worthy over time. Design of the mic pres is officially attributed to Midas but, again, it feels that they had a lot more to do with the product than that. A sound engineer friend said this of the sound quality: "We jumped between different mix projects, and I've yet to hear the sound of the desk. All I've heard is the sound of your mixes." Another engineer friend has spent much time on the Midas Pro2, and he feels the X32 has '75 per cent as much quality and functionality' as the £18,000 Midas. The X32 made us question our prejudice, and we hope others will too, as this prejudice could deny them some serious, low budget audio power. It is a bridge between Midas and Behringer and, for this reviewer, it's also a bridge between live engineering and DAW operating environment. We have taken the 'No Behringer' comment off our tech rider. Digital is now an affordable, better choice.